One of the most bizarre stories of the week is that of the 'fake' ambulances plying their trade around Beijing hospitals. 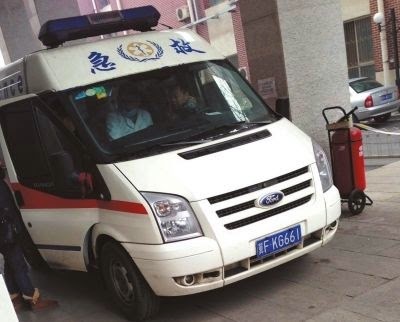 After hearing about fake drugs and fake doctors being widespread in China it should not come as any surprise to hear that shanzhai (山寨) unofficial ambulances are also operating. According to the Beijing Times the illegal ambulances park near major hospitals in the city and offer their transport services to patients. It is said that the poorly-equipped unofficial ambulances work in collusion with the hospital staff (who receive commissions) to charge patients exorbitant prices for transporting patients to and from hospitals and as transfers between hospitals. "Security guards at many hospitals have tried to stop these illegal ambulances from operating in and around their facilities, but they are afraid of being sued by patients and family members for delaying medical treatment," the article says.The unofficial ambulances have found a gap in the market because there is an insufficient number of genuine ambulances, the article says. live poultry markets or poultry farms could serve as an early warning system of viral threats to man." In the same vein, researchers in Zhejiang have found that poultry kept in local markets carry a veritable cocktail of influenza viruses including H7, H9 and H5 and two NA subtypes (N9 and N2), as well as H7N9-related reassortment intermediates H9N9. "The co-circulation not only reveals that Huzhou is one of the geographic origins of the novel H7N9 virus, but also poses a potential threat to humans in the future," they conclude. More optimistic news in relation to another virus, namely EV71 enterovirus, the causative agent fro hand foot and mouth disease. A review article from the Third Military Medical University and National Engineering Research Center for Immunological Products, Chongqing notes that China has developed three promising vaccines against the disease that have passed Phase III trials, and are expected to be available in the near future. The scandal over the drugging of kindergarten children with antivirals is widening, with claims that a kindergarten in Jilin has also been giving the drugs without parental consent. The initial reports from Shaanxi that children were being given antiviral prophylaxis supposedly to prevent coughs and cold have justifiably caused outrage among parents. The odd thing is why such an obscure antiviral as the biguanide moroxydine was chosen to give children. A 38-year old Beijing woman is taking legal action against a Chaoyang health and beauty spa for half a million yuan in compensation after the "fat dissolving injections" she was given resulted in severe ulcers. In a court case the woman said the 'medical' staff at the clinic were unqualified and the "no side effect" lipolysis injections turned out to be albumen that triggered allergies and skin ulceration requiring skin grafts. The Economist has a feature on the 'homosexuality cure clinics' in China, where people can pay around $1700 or a three month program of psychological treatments that supposedly deter them from having gay tendencies by giving them unpleasant injections and treatments in while watching sexual imagery. The clinics are said to be encouraged by the Confucian social pressure to be a good child and conform with traditional Chinese values. And while we are on the subject of dodgy treatment Xinhua reports that advertisements for fake and worthless remedies and clinics are as widespread as ever, despite laws intended to crack down on the. In a long article, Xinhua reporters describe how newspapers are still full of ads for fake treatments or treatments for which exaggerated claims are made. Industry insiders said the marketing of fake medical products and services was a high profit, low risk business as there was little enforcement. Government departments said fake products were widespread and it took a lot of time and resources to track them down and prosecute offenders.